San Jose is the largest city in the San Francisco Bay Area, home to more than 1 million residents and 170 companies. Situated at the bottom of the San Francisco Bay, it is Santa Clara County’s seat and the gateway to a major high-tech center, the Silicon Valley, with technology giants such as HP, Adobe, Apple, Cisco, eBay, Intel, Google, Yahoo, and Facebook, to name a few. 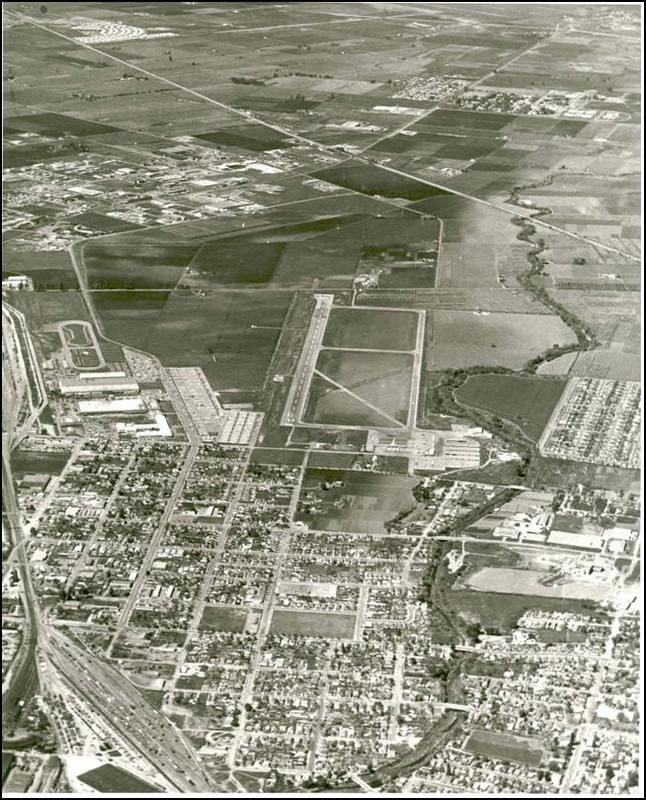 Compared to San Francisco and Oakland, San Jose was slow to even acquire land for an airport; barnstormers and the like used the private fields surrounding the city. San Jose voters rejected the 1928 bond for a municipal airport, and the Citizens Airport Committee was unable to see their dream come to fruition. That all changed a decade later, in 1939. Leader of the Citizens Airport Committee, Ernie E. Renzel, personally selected an area part of the Crocker Family’s Stockton Ranch, for an airport. The site had been approved by US Bureau of Air Commerce for diversions from San Francisco Airport. This location was recommended because San Jose experiences little fog, of which lasts until 10 AM. Shortly after, a $300,000 bond was finally approved by San Jose voters, allowing the land to be purchased. World War II created a nearly four year hiatus from airport development and banned general aviation 150 miles from the Pacific Ocean. Near the end of the war Jim Nissen, commercial pilot, test pilot, and engineer, and two partners started up a general aviation enterprise named “California Aviation Activities” using 16 acres leased from the airport. They built a dirt runway and a hangar at SJC. The next year, Nissen sold his share of California Aviation Activities and became the airports’ first manager, with Renzel as Mayor. The official dedication ceremony of San Jose Municipal Airport took place on February 1, 1949. Southwest Airways (no relation to Southwest Airlines) relocated from Moffett Field to San Jose and landed a DC-3. The DC-3, piloted by Captain John Dodge, carried two pilots, seven passengers, and 2,550 baby chicks. The chicks were unloaded and all the passengers continued to Los Angeles. The first terminal opened the next year. 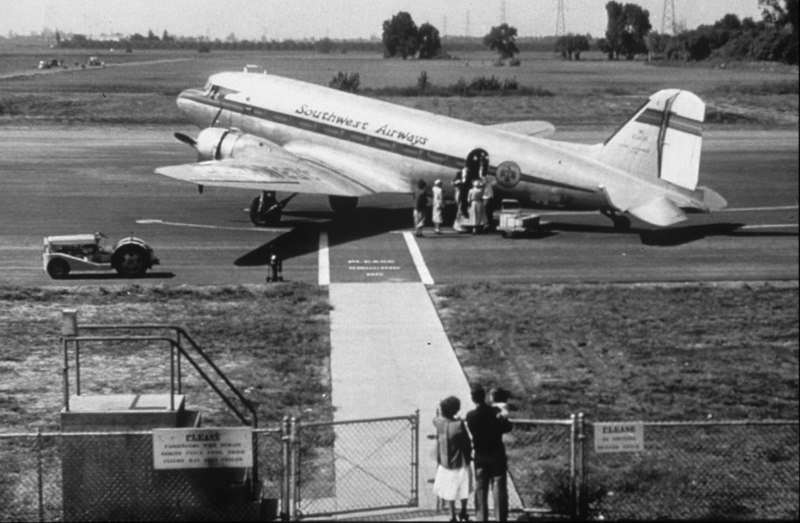 In 1951, San Jose recieved an estimated $8,000 worth of radio equipment and a federal grant for runway expansion. San Jose was supposed to be the SF Bay Area Airport if San Francisco and Oakland were bombed. Perhaps the most difficult battle was land acquisition. Both cities agreed that Santa Clara would sell Laurelwood Farm to San Jose in 1951, but the next year Santa Clara refused to sell. On top of that was a farmer by the name of Joseph Gianni. Gianni agreed to sell 60 acres to Santa Clara, but decided to sell it to San Jose. In response, Santa Clara annexed the land. Gianni sued and won, but died shortly after. His land was returned to San Jose and land north of Brokaw Road was purchased in 1953. On June 14th, 1953, the City Council held a dedication ceremony for a new taxiway and the 50th anniversary of powered flight. Robert and Lenore Fowler (glider and sailplane pioneers) brought a Wright motor and two gliders; Nissen and James Mathiesen (from California Aviation Activities) brought over their plane from 1912, a Fairchild biplane owned by the Reid family, a Hiller helicopter, and some engine cutaways. A cafe was added to the terminal shortly after, but the administrative terminal had reached full capacity. Three “temporary barracks” were added to relieve the congestion. 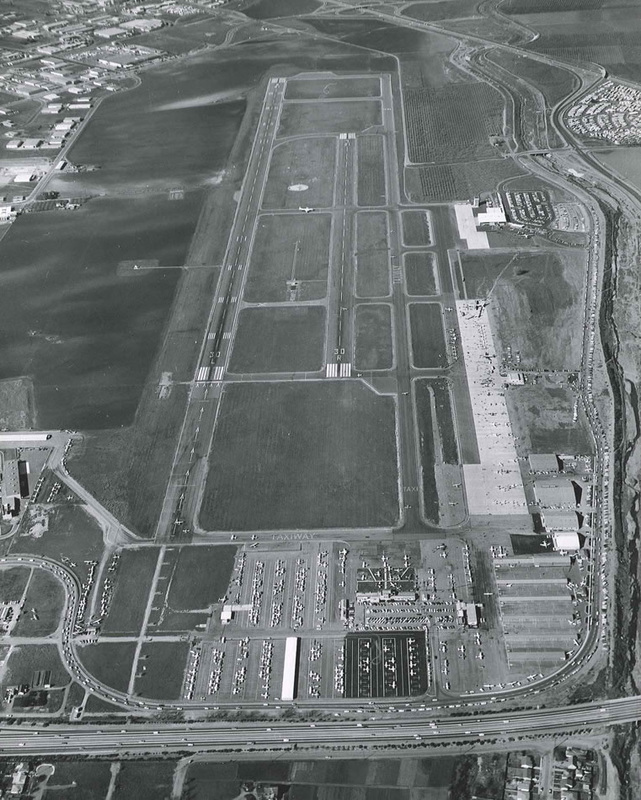 In 1955, San Jose and Santa Clara committees struck a deal in which San Jose would trade land suitable for industrial sites and Santa Clara would give land for the airport. Even with a land land expansion, most of SJC was undeveloped. Power lines bordered the airport, the Guadalupe River needed to be realigned, and pheasants were nuisances, so much that pilots and airport employees were allowed to shoot them during sunrise. By June of 1957, a 6-story control tower opened to the east of the runway. It was part of a construction project which also included the realignment of the Guadalupe River, runway extension, and a new terminal. Brokaw road finally closed in 1958, part of a deal in which San Jose would partially fund the construction of De La Cruz Blvd to the west. To the eastern perimeter, construction started an industrial park. Highway 17 (now Interstate 880) was almost complete, bordering the airport to the south. 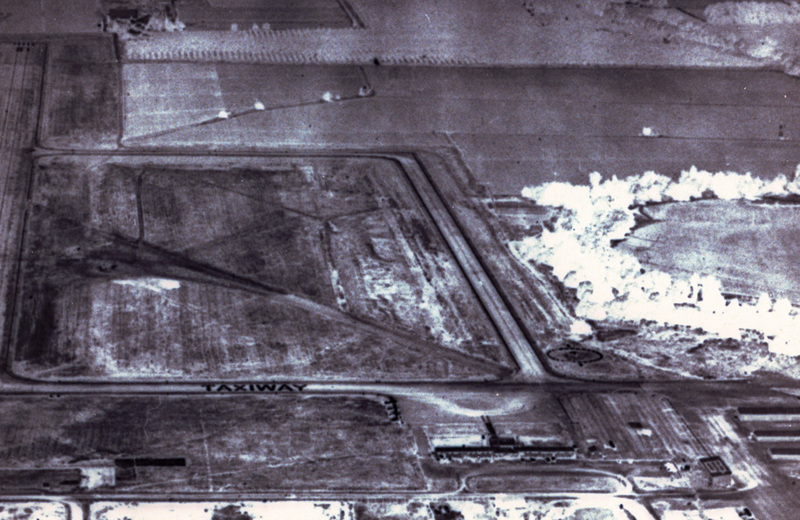 Construction of a 4,419 foot second runway finished in 1961 and the original runway was lengthened to 6,975 feet. Airport Village, a recently abandoned emergency housing development, was demolished. Some of the barracks were added to the terminal. 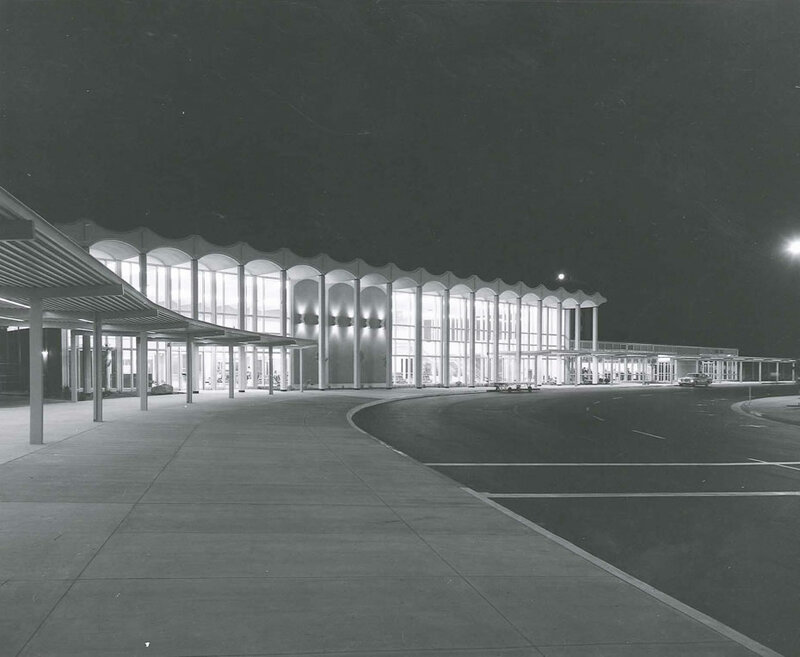 Construction of a new terminal, designed by local architect Hollis Logue Jr., started in 1964. On July 6th of the same year, air traffic controllers recorded the millionth aircraft movement. San Jose State Aeronautics Program relocated to their former location on Coleman Ave. Another pest, this time sow bugs, interrupted airport operations. Millions of them gathered on the runways and seagulls ate them, disrupting air traffic. By 1965, San Jose was the 16th busiest towered airport in the United States, and the new terminal building opened on September 16. The dedication ceremony occurred a year later, on November 6th, 1966, after the completion of a restaurant and cocktail lounge. 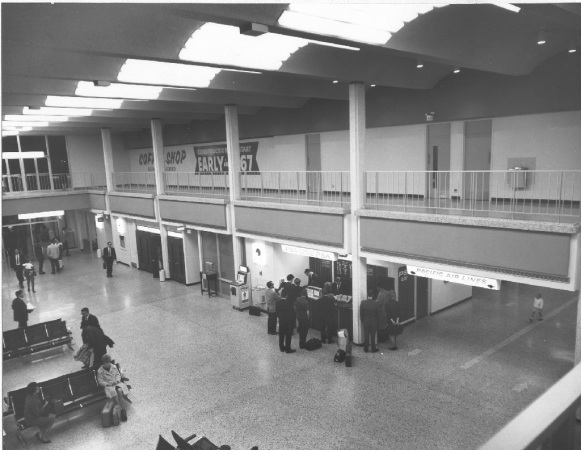 The original terminal (left) was used for general aviation until 2000, when it was demolished for the expansion of runway 30R.